25 Fun Accessories That Say, "I'm Engaged!" Share your excitement with the world with one of these fun accessories for the bride-to-be. Show off that sparkler with a cute cell phone case. 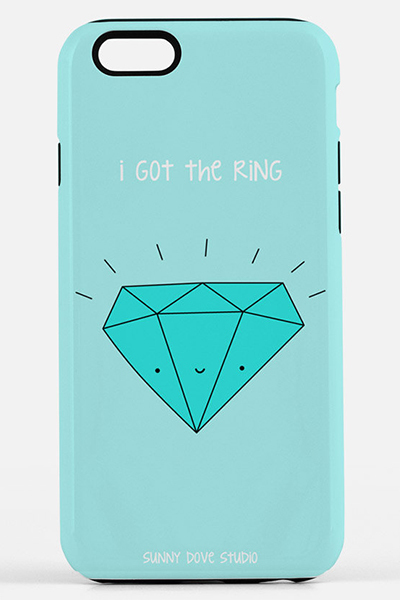 You’ll be walking down the aisle soon; add your special date to a charming phone case. Let them know with this delightful cotton tote. Spread the news with a hand-lettered canvas tote bag. Proclaim your new status: fiancée! Share your excitement with a tee for the bride-to-be. Let all the single ladies know... with a sparkling rhinestone hoodie. Kick back and announce your big news with these clever socks. A glittery customized cap for the soon-to-be spouse. This adorable trucker hat is perfect for your bachelorette party. Photo Credit: Giving Glitter Co.
A sparkling keychain says it all; personalize it with an engraved mini-heart. A unique hand-stamped necklace is a wonderful engagement gift. This lovely bracelet is hand-stamped with the happy couple's initials and wedding date. Sorry, guys... I'm getting married! Cute stud earrings are a fun accessory for the new fiancée. Celebrating at the Magic Kingdom? Shout out “Just Engaged” with a decal for your magic band. Proclaim your storybook romance with these glittery ears, perfect for your Disney trip. This beautiful bespoke gift box includes a canvas clutch, “bridal musings” notebook, ring cone, and festive confetti pop. An amusing beer mug and stemless wine glass set makes a great gift for the happy couple. A hand-stamped mug delivers a subtle boast with your morning coffee. Treat yourself to a customized water bottle for pre-wedding workouts. Flaunt your sparkler with a fun decal to adorn a favorite wine glass or mug. Plan your dream wedding with this gorgeous gold leather-bound journal. He put a ring on it! Celebrate with a special satin sash for the "Feyoncé." Commemorate the special occasion with a keepsake "engaged" Christmas ornament.